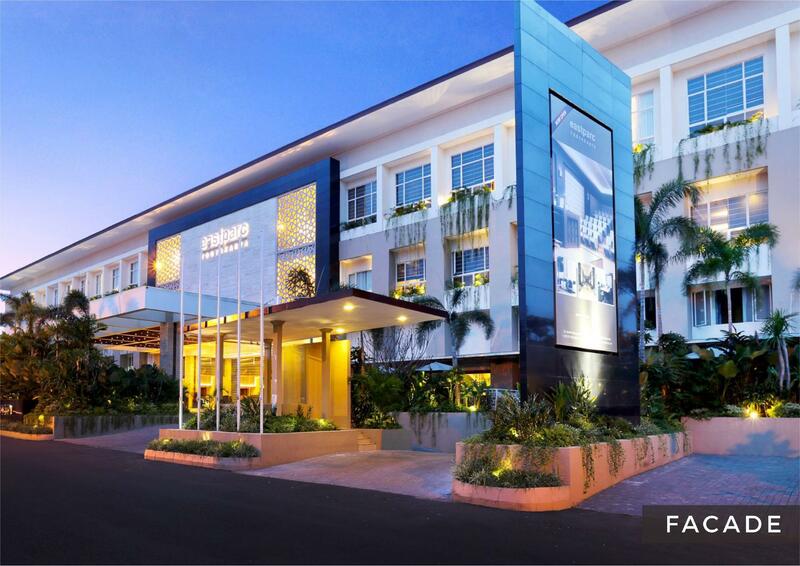 Heeft u een vraag voor Eastparc Hotel Yogyakarta? Eastparc Hotel Yogyakarta is gelegen in Depok in Jogjakarta en een uitstekende keuze voor een ontspannen verblijf. Het levendige stadscentrum is slechts 7.2 Km verwijderd. Dankzij de praktische locatie liggen alle belangrijke trekpleisters in de buurt van het hotel. Het Eastparc Hotel Yogyakarta biedt gasten superieure dienstverlening plus een breed scala aan voorzieningen en is toegewijd om uw verblijf zo comfortabel als mogelijk te maken. Voor het comfort en gemak van de gasten biedt het hotel 24-uur roomservice, gratis wi-fi in alle kamers, 24-uur receptie, faciliteiten voor mindervaliden, bagageopslag. De ambiance van het Eastparc Hotel Yogyakarta weerspiegelt zich in de inrichting van de kamers. plasma tv, handdoeken, internet (draadloos), draadloos internet (gratis), rookvrije kamers zijn slechts enkele van de faciliteiten die u ter beschikking staan. De complete lijst met recreatiemogelijkheden is beschikbaar in het hotel, inclusief fitnesscentrum, zwembad (buiten), kinderspeeltuin, zwembad (voor kinderen), tuin. Het Eastparc Hotel Yogyakarta is een uitgelezen keuze als u een kwaliteitsaccommodatie zoekt in Jogjakarta. The property does not offer vegetarian meals. De accommodatie bevindt zich in de buurt van enkele moskeeën. De oproep tot het ochtendgebed, om 4:30 uur, kan lichte slapers wekken. De accommodatie biedt gratis wegwerpoordopjes aan. Verzoek hier a.u.b. om bij de klantenservicemedewerker of de receptie. Deze accommodatie serveert in het hotel-restaurant en in de minibars in de kamers geen alcoholische dranken. Gasten mogen hun eigen drank meenemen en in hun privékamers nuttigen, maar niet in de openbare gebieden, zoals de hotellobby, bij het zwembad of in de restaurants. Tijdens het hoogseizoen (de periodes rond Eid al-Fitr, Kerst en Oud en Nieuw) kunnen gasten om 15:00 uur inchecken. Gasten ontvangen een gratis maaltijd indien ze na 15:00 uur aankomen en hun kamers niet onmiddellijk beschikbaar zijn. De Deluxe en Premier kamers bevinden zich niet op dezelfde verdieping. Gasten kunnen om kamers op dezelfde verdieping verzoeken, maar deze zijn onderhevig aan beschikbaarheid. Neem in geval van vragen rechtstreeks contact met de accommodatie op. Opstartproblemen met de kamer ( sleutel die niet werkt, rare geluiden), werden ruimschoots goedgemaakt met de service, een nwe kamer en een ontbijt die ongekend uitgebreid was. Positief verrast, mooie nieuwe hotel in de buurt van amplaz. This hotel is excellent value for money. I travel a lot and this hotel is very nice. The staff are very accommodating. and kind. The rooms are a nice size. 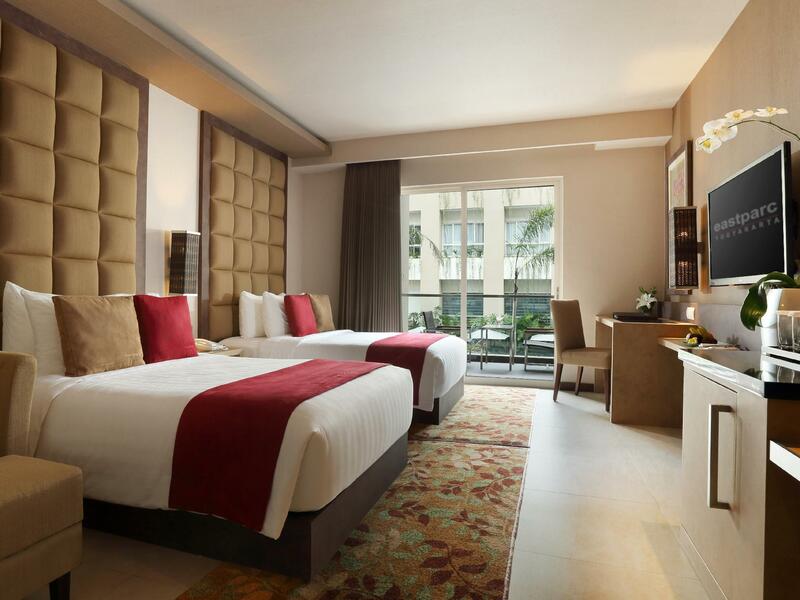 The decor is very nice and the price is extremely cheap for this quality of hotel. I have stayed here a few times now and I will be back. We were lucky to have connecting room at the ground floor, close to swimming pool and restaurants. We stayed for 5 nights and one of the best hotels that we stayed ever. The buffet breakfast was fantastic, spoilt for choices. Mini water park is good enough for kids, and adult pool also is nice. The room is super clean, the housekeeper even put our kid's bear properly on bed and my kid went awwww. Nice touch from them. The Security were super friendly, happy to see them smile while greeting us. I love Yogya, nice food, nice people and lots to see and do. But this hotel made our trip more enjoyable. Please stay at this hotel! Hotel was perfect from the check in, friendliness of hotel staff, good breakfast but please be wary about the security lapse that had happened to me. Usually in other overseas hotels, upon leaving my room, i have the habit to ensure that the door is fully locked. Unfortunately for EastParc, my room is still accessible even after i close the door from outside (even without tapping my room key). I tried once more to ensure that i really close the door tightly, but no, it is still accessible. Had to call the technician to get it fixed. And of which, since the fixing of the door card mechanism takes quite a while, i wanted to just place my personal belongings in the safe box, UNFORTUNATELY the safe box is not working as well! Again they’re getting another technician to have it fixed. So in conclusion, i have to bring all my personal belongings out with me to start the day (was a full day). So please please have the habit to check the door when u leave ur room! I traveled with my husband and 10 year old son. It was a nice hotel with a lot of activities for kids, pool with slides, green house and kids movie theater. Very friendly staff. The breakfast was so good with a lot of choices. 10 minutes to the malioboro town and walking distance to the mall. Breakfast was really great and there was lots of selections. Staffs were really polite & helpful in so many ways. They also gave free calendar as I stayed there for new year. Definitely will stay here again if I come back to Yogyakarta. + 💯 % suitable for holidays w children + nice swimming pool +kids mini cinema +mini playground +yummy homemade bakpia&jajanan pasar + room space +breakfast was great -nice & friendly staff - (need to be improve) 1. Variety of kids movie 2. Swimming pool, better use salt than kaporit/chlorine. This hotel provides the best experience in Jogja for our child Thanks to the management!!! Thank Eastparc for the lovely stay. Nice traditional breakfast. Come with beras kencur as the dessert drink, what a healthy morning. Gardens, kids playground, and pool are also well maintained. Definitely worth revisits. Had a pleasant 3 nights stay at this hotel. The staff performance is top notch..from the front door to the room service...they always helpful, friendly and always have a smile on their faces no matter what time it is. The breakfast selection was great...the selection was balance between local and western. Room was clean and comfortable. The hotel surrounding is good too and well kept. I would mind returning to this hotel again. Pros: modern, big room. Very nice, friendly n helpful staff. Variety of breakfast buffet. Children facilities are good. Awesome slides at the swimming pool. Cons: shower tiles on the wall & floor are dirty. More different types of breakfast food each day would be great and more of western food. Children facilities should be open anytime. Extend the used of slides. The hotel is far from centre of town- abt 30 min car ride. It has only one restaurant and the surrounding areas did not have much food choices within walking distance for a foreigner- we had to order via grab food whenever we decided to stay in for lunch or dinner. I also wish I had known this is a halal hotel and thus no alcohol served. We had to go out for food every night and if we wanted some evening cocktails. Thank god for the easily available GRAB service, we would have been very unhappy otherwise. 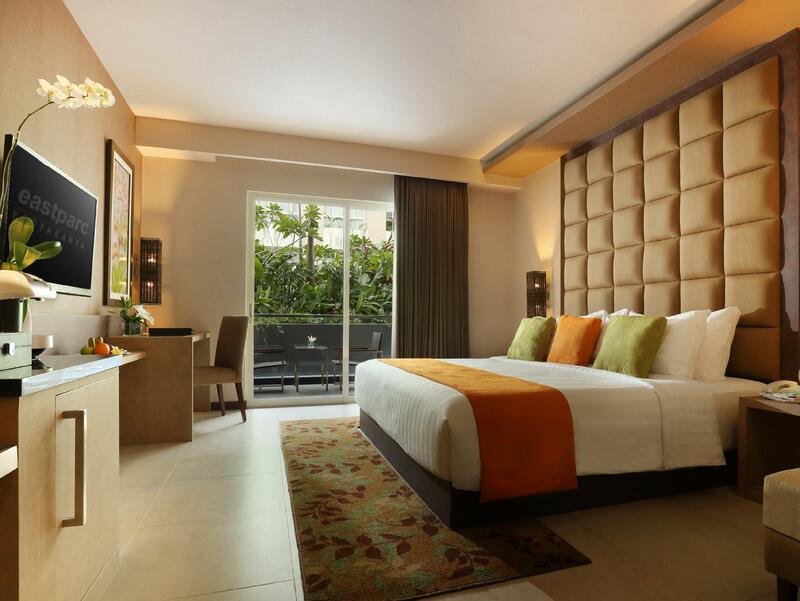 If I come back to Jogja, I will stay in a hotel closer to town, bit in this hotel. very good hotel, clean, spacious, lots of children facility. there's two playground, pool with slides, animal garden and mini cinema. the room very clean and big. breakfast variety are very good. the staff very friendly and love children. We stayed for 4 days and 3 nights during our holiday trip to Yogjakarta. Everthing is perfect. Worth the price! So comfortable as well and the breakfast buffet is awesome! Thank you Eastparc keep up the momentum.